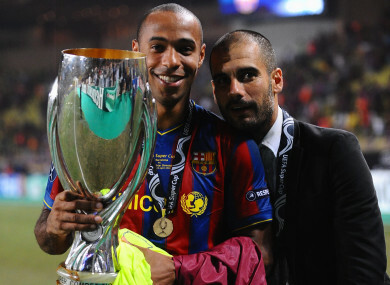 Thierry Henry holds the Uefa Super Cup alongside Pep Guardiola in August 2009. “Arsene unlocked so many things in my mind — what it meant to be a professional, on how to perform. “You learn from people, but also need to put your own mix into it. Pep for me is the reference. I re-learnt how to play the game when I went to Barcelona under him. Email “Henry: Wenger and Guardiola inspirations for my coaching career at Monaco”. Feedback on “Henry: Wenger and Guardiola inspirations for my coaching career at Monaco”.